When they tell the Great Sagas of Heroes,do you hearken to the stories of those that battle a force of mere men and beasts? Or is your blood stirred by the Tales of Daring Deeds and Bold Cunning used against a single Foe so terrible, it was all but considered Undefeatable? Bring on the Epic Fight, and wage battle fiercely against the dread Nemesis that no One can outwit, the Arch-Rival that no One can match, and the all-devouring Monster that no One can assail! In Kill Or Be Killed #1, your Heroes must pit their powers against a terrible demon-spawn that aspires to become an Prince of the Abyss! A single dynamic “boss-style” Encounter for five 12th Level Characters. 2 New and Unique Monsters. 3 New Underground Hazards that can also be used in your Campaign. A Full color Encounter Map and Monster “Chits”. 3 Unique & Powerful Magic Items (Relics) that can be “dropped” from the boss. 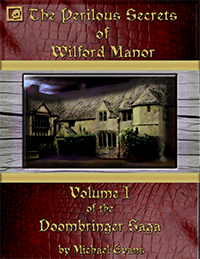 Adventure Hooks, Background Story, and more to allow this Encounter to be used in your campaign as either a single gaming experience, or part of a greater adventure of your own creation! 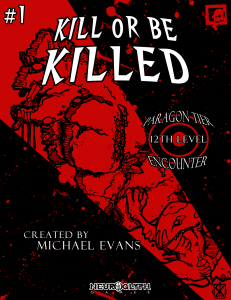 Kill or Be Killed #1 is available for sale now from RPGNow and Paizo.